My very first video game console as a kid was the Atari 2600 (aka. Atari VCS). I was a little late to the game since I got mine about the time of the famous 1983 video game crash. That bubble burst was what allowed me to get an Atari in the first place. Up until that time the systems were a little rich for the decision makers’ (my parents) blood. However, when the price of a C64 hit $50 at Thrifty Drug–everyone sold Atari systems by that point in the game (a big reason for the crash)–my mom was willing to entertain my desire for a video game system. I had a lot of games for the 2600 because the 83 crash made them cheap. Toys ‘R’ Us (RIP) was giving some of them away for $5 with a $5 rebate. 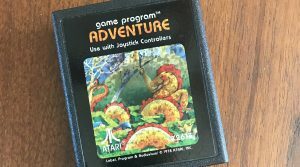 Among my collection was Adventure, a game that I will say I did not actually understand, and still have questions about. I think you need to suspend your expectations when playing Adventure. Dragons look like weird vertical duck things, and you are literally a large square pixel. All that and some of the aspects of gameplay are a little nebulous. I have to be honest, I didn’t play this game too much, I liked Pitfall, Atlantis, and even Haunted House a lot better. Adventure is supposed to be… well, an adventure. Theres a castle and sort of puzzle like stuff and the weird vertical duck dragons and keys and stuff. It didn’t come off as that to me when I was eight years old and so the game experience was more frustrating than fun–probably the reason I gravitated toward easy games like Atlantis. What I didn’t know when I was a kid was that Adventure had a secret, the first known Easter egg in a video game. 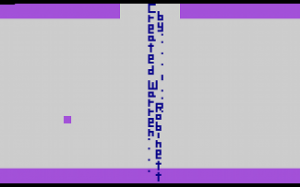 Warren Robinett, the programer of Adventure, knowing that he would get no credit for his programing prowess (Atari was scared to name their talent because programer poaching was real), decided to put his own credit into the game without any sort of authorization from whoever he answered to at work. Warren put a secret room into the game with his name on it… literally. And so the tradition of the video game Easter egg was born. Good story eh? Was this really the very first video game Easter egg? Most video game historians think so. I like to believe it was, either way Adventure is actually a pretty cool game even if eight year old me didn’t realize it in 83. Today I will play Adventure on an emulator now and then, but I’ve never actually tried to find the secret room, maybe I should do that. Hey this is Joe from the @theoasisbbs Instagram. Good article on Adventure. Couple of things. Did you know that Warren Robinett formed the Learning Company and sold it for over 600 million. The dude has made serious bank for starting off with Adventure and Slot Racers. Also I meant to tell you when we talked on Instagram that there is a Adventure type game available for iOS. I stumbled across it a couple of years ago and have it on one of my iPads. It’s called Pixa and it has a bunch of levels, each randomly designed when you reset the game. Definitely in the spirit of Adventure, but on a bit of a larger scale. You will not solve it in a single session. Here’s a Youtube video from the developer.